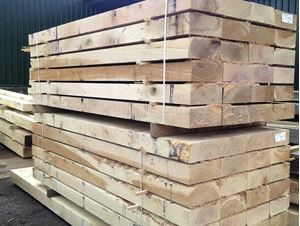 Our freshly cut new European Oak sleepers are one of our most popular products. Oak sleepers can be used for a number of external projects such as garden landscaping, planters, garden edging, retaining walls, raised garden borders, garden steps, outdoor rustic looking furniture and almost any imaginable garden use you can dream of. Please remember that due to the nature of oak sleepers the dimensions can vary very slightly. If you have any questions regarding our oak sleepers please feel free to contact one of our very experienced sales team. Current Lead Time approx 7 - 10 working days from the date of you firm order. Please note the sleepers may be supplied overlength for end trimming on site. It is the customers responsibility to assure there are means of off-loading equipment on site.